August 20, 2008 is the 11th major day of the 2008 Olympic games, the below article lists some of the highlights. Jamaican Usain Bolt, who recently set the world record for the one hundred meter sprint, has set a new world record in the 200 metre sprint with his time of 19.30 seconds, 0.02 seconds quicker than the previous world record, which was set by Michael Johnson in the 1996 Summer Olympics. The silver and bronze went to Americans Shawn Crawford and Walter Dix, respectively. Russian Larisa Ilchenko took home gold in the women’s marathon swim. Her final time 1:59:27.7. She beat the United Kingdom‘s Keri-Anne Payne by 1.5 seconds, and Cassandra Patten, also of Great Britain by 3.3 seconds. Belarusian Aksana Miankova set a new Olympic Record and won the gold medal in the final of the women’s hammer throw with a score of 76.34. Yipsi Moreno, who was representing Cuba, won the silver medal, while Wenxiu Zhang, from China finished in third place with a score of 74.32. Zhang also set her new season’s best. Jamaican Melaine Walker set a new Olympic record, national record and won the gold medal in the final of the women’s 400m hurdles with a final score of 52.64 seconds. Sheena Tosta, who was representing United States, won the silver medal, while Tash Danvars, from Great Britain, finished in third place with a final score of 53.84, a new personal best. Canada, China, Chinese Taipei, and the Netherlands were eliminated in the matches leading up to the Baseball semi finals which will take place on August 21. Chinese Taipei defeated Canada in a closely matched 12 inning 6-5 game, but both failed to advance. China was defeated by Cuba 17-1, and the Netherlands was defeated by South Korea 10-0. The United States and Japan also played, with the US defeating Japan 4-2, but both were already guaranteed entry into the medal round. Japan will play South Korea in the bronze medal round, while Cuba and the United States will compete for the gold medal. Liudmyla Blonska, who won silver in the heptathlon is suspected of using illegal substances. As a result, she faces a lifetime ban and she may be stripped of her silver medal. 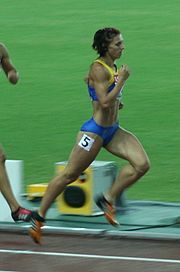 Kelly Sotherton, who competed against Bloska, criticised the athlete. “I’ve been saying all along that she got caught doping when she was scoring 6300, so how can she not be doping and scoring 6800?” she said.